SALT LAKE CITY, UTAH (January 22, 2019) - Governor Gary Herbert declared January 21-28, 2019, Public Media Week in Utah, recognizing the countless contributions public media stations have made to our nation’s civic life. Lt. 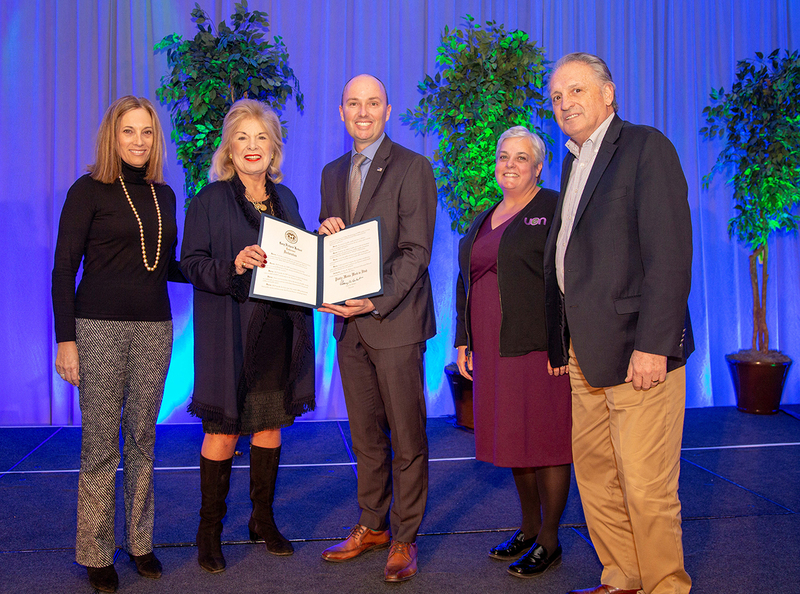 Governor Spencer Cox unveiled the proclamation to hundreds of station leaders today at the CPB Public Media Thought Leader Forum and 2019 National Educational Telecommunications Association Conference in Salt Lake City. From left: CPB Board Member Elizabeth Sembler; CPB President and CEO Patricia Harrison; The Hon. Spencer J. Cox, Lt. Governor of Utah; Utah Education Network COO Laura Hunter; and KUED General Manager James Morgese. The Lt. Governor thanked the gathering of public media professionals for their work and spoke about the impact of public media on the country. “We need public broadcasting to bridge the gap and remind people of shared facts. We can’t afford to lose you,” he said. The Public Media Thought Leader Forum and 2019 NETA Conference are being hosted by the Utah Education Network and KUED through January 24, 2019. Tuesday’s Public Media Thought Leader Forum, sponsored by the Corporation for Public Broadcasting, engaged leading experts from many disciplines to help identify and scale innovative approaches to content creation and engagement. NETA is a professional association of public television licensees created in 1997 from members of the original Southern Educational Communications Association (SECA, incorporated in 1967) and the Pacific Mountain Network (PMN, chartered in 1978) to serve and support public television licensees and public media’s education mission. The organization has members in 43 states, the District of Columbia, and the Virgin Islands. Follow NETA on Twitter and on Facebook.